The Alaska advance Healthcare directive enables you to choose someone to make medical decisions for you. Most often, these documents specify the type of medical treatment you would want if you were on life support with no chance to regain consciousness. If you would not like to continue living under these circumstances, it is crucial to execute a health care directive to state that. Otherwise, family members and doctors will consult each other and decide whether to continue with life-sustaining treatment. Your family members may have quite different beliefs than you about the value of human life, and you may believe that independent living and quality of life are more important than simply maintaining life. Executing a health care directive can prevent a devastating conflict regarding these issues. 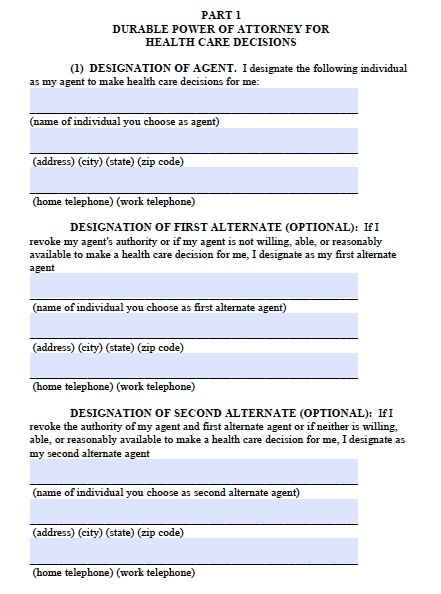 The document also allows you to choose one or two alternate agents, which enables the principal to revoke the previous agent’s authority if that agent is not willing or able to make reasonable decisions regarding the principal’s health care. The form goes on to list specific types of treatment you would or would not like, such as receiving artificial nutrition and hydration on a trial basis to see whether your condition improves, or receiving artificial nutrition and hydration indefinitely. The agent’s authority becomes effective when your primary physician determines that you cannot make your own healthcare decisions. When deciding on which treatments to authorize, you should consider how much you value independent living and your religious beliefs.